The sculpture ‘Reachout’ won a top award at the RHS Chelsea Flower Show and will be given pride of place in Blackburn. The initiative was put together by Newground, a member of the Together Housing Group in Blackburn. Teaming up with John Everiss Design, they created ‘Reachout’ depicting the difficult journey many young people face in the town and how their lives can be changed with the right guidance and support. 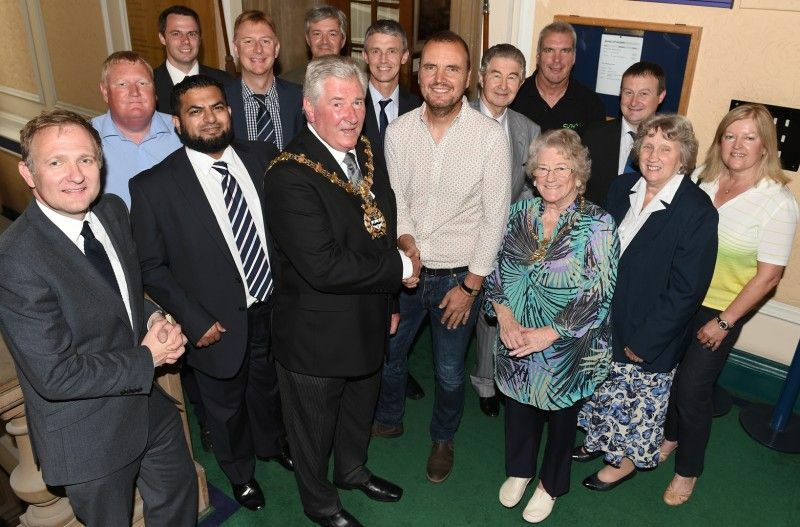 The team were honoured at an event at Blackburn Town Hall, where Mayor Cllr Alan Cottam thanked them for returning the sculpture to Blackburn and praised them for their hard work and national recognition. The piece, designed by former Myerscough College student, John Everiss, was recognised at the prestigious Royal Horticultural Society annual event. John runs his own local garden design company and is based in Chorley. Myerscough College, along with CSH Transport and Euro Garages and are also a major sponsor of the project. Apprentices, Calum Mackenzie and Antonio Figueiredo were chosen to help with the build of the finished design down at the world renowned RHS Chelsea show. The ‘Reachout’ sculpture includes a steel woman with her hand dipped into a stream that runs through a series of stone pillars, will have its new home on a roundabout on Haslingden Road. It was one of the most talked about features at this year’s RHS Chelsea Flower Show, where it won the coveted Gold Award within the ‘Fresh Garden’ category. The concept behind the garden sculpture evolved following a discussion with young people in the borough. Nick Riley, Director at Newground said ‘Inspirational projects is what we are about and introducing our Reachout concept to local business is what inspired them to pledge funding. Bringing the medal, and the entire garden back to a site within Blackburn, for the people of Blackburn to see is great. Without everyone being part of this equation this would not have happened and we cannot thank them enough’. The artwork is a striking metal sculpture of a crouched figure leaning against a slate wall. A hand dips into a nine metre long water-channel, leading the figure through a series of stone columns that become smaller and smoother, gradually blending with the planting. It represents a young person’s journey into society and adulthood. Listen here: http://bit.ly/1yqFJDX, where Cllr Maureen Bateson, Executive Member for Regeneration, Cllr Jim Smith, Executive Member for Environment and Cllr Alan Cottam, Mayor of Blackburn with Darwen talk about the sculpture, the win at Chelsea and its new home within the borough.